Have you ever found yourself having an issue with installing some software, configuring an application, or running into a software bug? I’ve run into these situations many times over the years. The normal progression is to try the action again, and if it fails, try the Google. If you are unable to locate a solution, you’ll then need to contact technical support. In most situations, you are presented with one of two options. You can call or email your technical support staff. If you elect to call the technical support staff, one the first questions they will most likely ask (after what your name is) is, “What is the problem and how can we reproduce this issue?” From there you will have to verbally explain the issue. Sometimes this is simple, but what if the problem is more complex and requires multiple steps to reproduce, and what if within those steps there are details that are very specific to your problem? This can sometimes be difficult for you and the technical support staff to work together over the phone on achieving a resolution. If you resort to emailing the technical support staff, and the issue is complex, you will end up doing a lot of typing to explain your situation. Perhaps you would take multiple screenshots, crop them, etc. You’ll also have to give any specifics between screenshots if you have to click a menu item. What if you could use a built-in utility that required no additional software, that could document your steps to reproduce your problem, that would be easy to email and send to a support person? 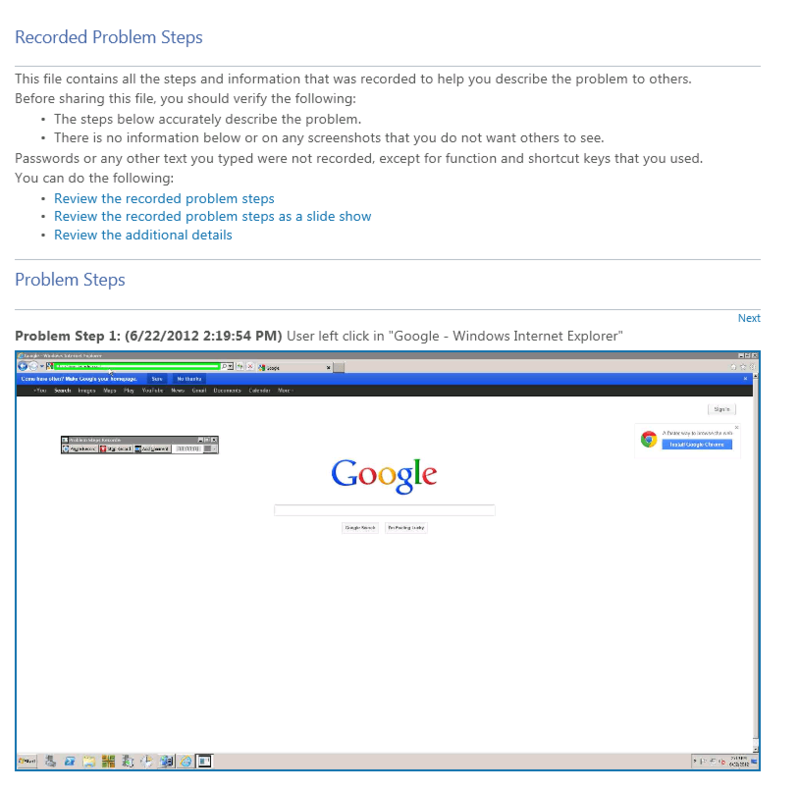 That’s where Microsoft’s Problem Steps Recorder (PSR) comes in. To launch PSR, just click Start > Run. 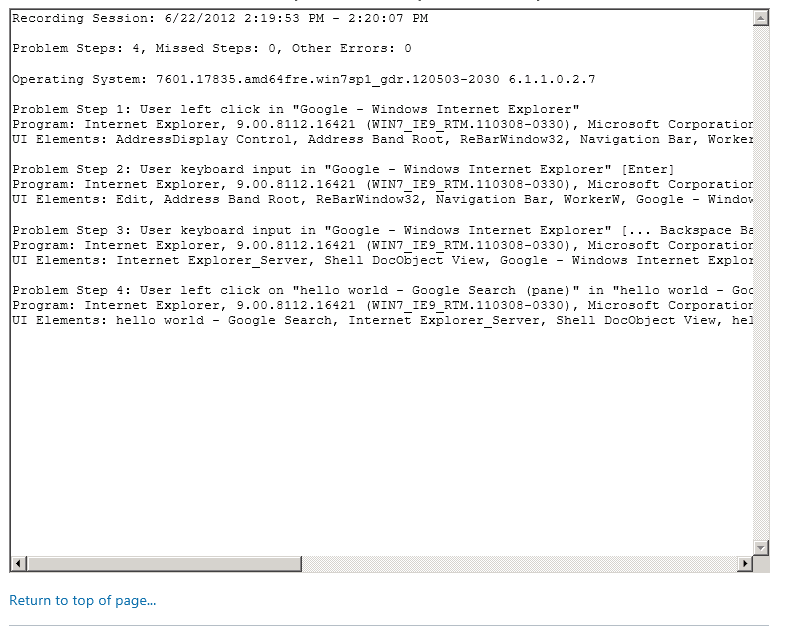 Then type in “psr.exe”. 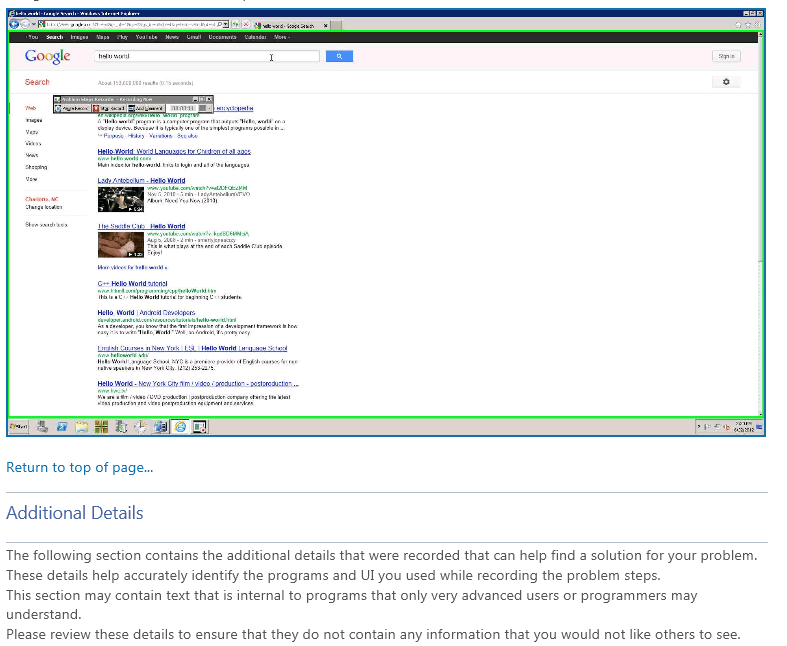 Alternatively you can click Start and then in the search box type in PSR. 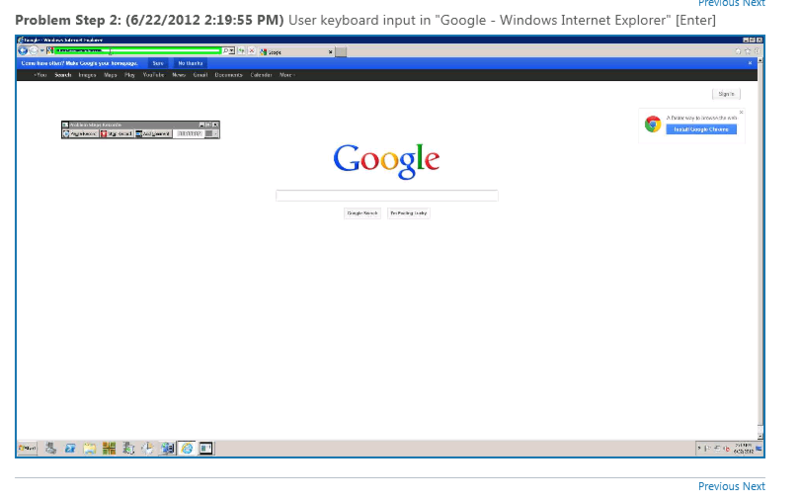 You will then see the PSR application on your desktop. Armed with this utility, you can record your steps to reproduce your problem and submit the .zip file to your support staff, who will be able to resolve your issue faster with all the information in one simple document. Another great use for this utility is for blogging. I have used this utility many times to blog about the steps needed to install some software or to configure an application. This is also helpful in writing documentation to help show someone else how to use a certain software program or navigate a website or in helping a friend or relative troubleshoot a technical problem. Below is a test I completed for this post. 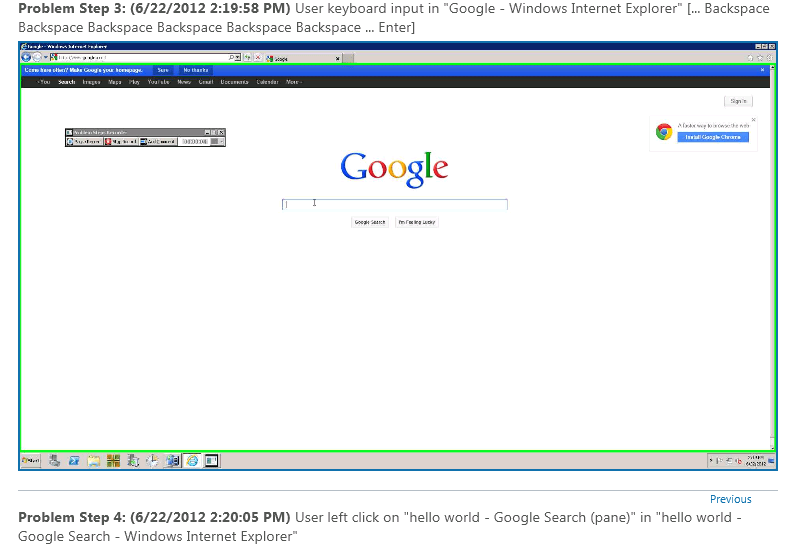 I recorded the steps on going to www.google.com and searching for “Hello World”.